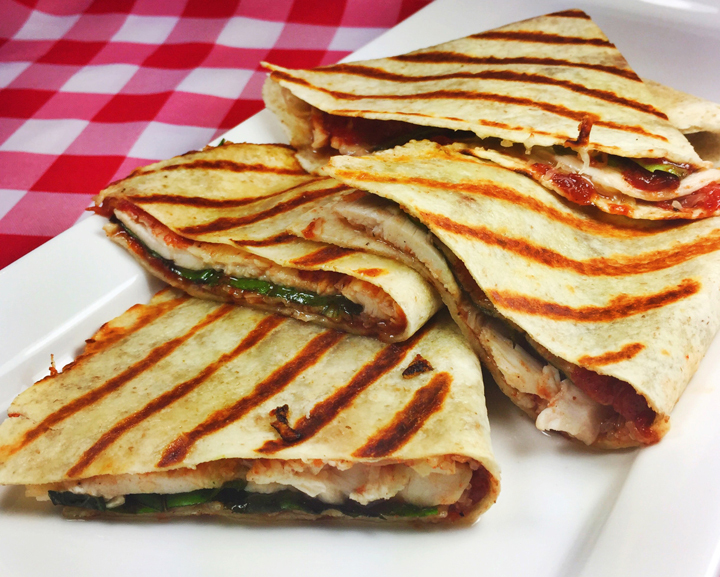 We load up our Italian flatbreads with thinly sliced chicken, Italian cheeses, homemade sweet & spicy Sicilian tomato jam, and fresh basil, then grill to crunchy perfection. Perfect for making ahead, or at your cook-out, our flatbreads are ready in minutes on the grill. Not grilling out? No problem! We’ve included instructions for a grill or sauté pan! Complete your Italian themed picnic and pick up some Bravazzi Italian Hard Soda! Thinly spread 2 tablespoons of tomato jam on each flatbread. Sprinkle ¼ cup of the cheese over the tomato jam, then top ½ of each flatbread with 4 ounces of thinly sliced chicken. Add 3 basil leaves over the chicken and fold the flatbread in half. Brush one side lightly with olive oil and place on the grill – oil side down. Brush the other side, cook for 3 minutes; turn when lightly browned and cook on the other side for 2 minutes or until the cheese melts and the chicken is heated. Repeat procedure with remaining flatbreads. Remove from the grill, cut in half and serve. Makes 4 servings. To cook in a skillet or grill pan: Heat a large nonstick skillet or grill pan over medium-high heat. Brush one side of the flatbread lightly with olive oil and place oil side down in the pan. Add a second flatbread and brush the other sides of both lightly with olive oil; cook 2 to 3 minutes on each side or until cheese melts and flatbread browns lightly. Repeat procedure with remaining flatbreads. Remove from the pan, cut in half and serve. Makes 4 servings. Preheat the oven to 350 degrees. Over a bowl, cut the tomatoes in half; using a spoon or your fingers, remove the seeds into the bowl, reserving the tomato water and seeds. Try to remove as many seeds as possible. Place the tomato halves in another bowl and toss with the salt and cumin. Oil a sheet pan with 1 teaspoon of olive oil. Place the tomatoes, skin side down, on the baking sheet and then in the oven; roast for 20 minutes. Remove from the oven and allow to cool slightly. Strain the tomato seeds and water through a fine mesh strainer; press hard on the seeds to remove as much water as possible. Reserve the tomato water and discard the seeds. You should have about ½ cup of tomato water. Slide the skin off the tomatoes and add the remaining tomato pulp to a large saucepan; discard the skins. Add the tomato water and the remaining ingredients. Bring the tomato mixture to a simmer and cook for 1 ½ hours until the jam is thick and sweet. Cool to room temperature. Store the jam in a tightly closed jar or container in the refrigerator. Makes about 1 -1 ½ cups of tomato jam.